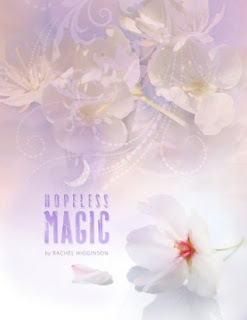 Hopeless Magic is a roller coaster of a book! We begin right after Kiran's big gesture and declaration of love for Eden. It should be as simple as going home and going public as a couple, except for the issue of Kiran's betrothal and fiance Seraphina, oh and the fact they need to keep Eden's identity from Kiran's father. Needless to say this perfect couple has a strong uphill battle if they are going to make their dreams a reality. This second installment really goes beyond the surface, pushing our favorite characters into some pretty difficult scenarios. Eden's having to walk an extremely fine line between her love for Kiran and her family's desires of joining the rebellion. I found myself a nervous wreck. Of course I wanted to her stay true to her heart and Kiran but at the same time I knew all the secrets she was keeping from him screamed lack of trust and let's be honest eventually the truth was going to have to come out. In addition, not being allowed to be around Kiran for any decent amounts of time and as a result spending more time with Jericho opens another set of doors into her heart, and I couldn't help but agree a relationship with Jericho would be easier and no doubt she is attracted to him. Yet at the same time I feel like being with Jericho would be settling, it's not a passionate all consuming love she feels for him. I absolutely refuse to give any spoilers away in this review, because a lot goes down in this book. I'm not necessarily surprised with Kiran's decision, he's young, he's making decisions based off emotion and not really looking at the big picture. But at the same time so is Eden. The two of them have a serious-forever kind of love, found at a really young age, at a time in life when they are trying to figure out the world. Of course they're going to be forced on journeys down unimaginable roads, that's what makes this whole star-crossed love story so utterly addicting and fantastic! I also want to touch base on Rachel Higginson's ability to really give each and every secondary character their own voice, their own impact on the story. Even though we are being told the story from Eden's perspective the secondary characters are written in a way that I find myself just as vested in what's going on with them. Without Avalon, Sebastian, Lily, Seraphina, Lucan....the list could go on and on. My point is though without these characters and the depth they bring to the whole story it just wouldn't be as good. Well done Rachel on a well thought out and brilliantly executed story.